The Fisk/e Family Association (FFA) was founded as a non-profit association in 1976 by a group of genealogists who were researching various Fisk and Fiske family lines. The Association is dedicated to the research and preservation of Fisk and Fiske history and genealogy. The FFA publishes a newsletter, on an intermittent basis, that contains articles and information of general interest to those interested in Fisk and Fiske history. These are distributed free to the major genealogical libraries in the U.S. and England. Although the FFA continues to publish newsletters, we no longer accept new subscriptions. Previous and current issues may be purchased on this Web site. Click the Newsletter image on the left for more information. What Is The Origin of the Names Fisk and Fiske? Many Fisk and Fiske families can trace their lineage to around 1200 to Eastern England, and there are several theories for the ancient origin of the names. One theory suggests that in all probability the Fisk and Fiske names originated in Scandinavia. The name Fisk means fish in Norwegian, Swedish, and Frisian. (In the 5th century the tribe of the Frisians inhabited the whole North Sea coast from the Rhine to the Elbe, and probably exercised some influence on the languages of the other tribes in that area.) Fiske is a Danish alternative spelling for fish. The Vikings invaded eastern England around 800, and many settled there. Many present-day Fisk and Fiske families can trace their roots to the eastern counties of Suffolk and Norfolk in England. Another theory suggests the original name was Fisc, which is an older form of Fish. Others suggest the name Fisc had to do with tax collection, so they may have been tax collectors. Yet another theory maintains the names Fisk or Fiske were named after a profession, namely a fisherman, or the name could have come from a place connected with fishing. All of these theories will soon be put to the test. The Fisk - Fiske DNA surname project is underway. The Fisk/e Family Association is offering subsidies to qualified persons who participate in the project. See our Sources page for more information. Is There An Ancestral Home? There is Stadhaugh Manor near Laxfield, Suffolk Co., England. 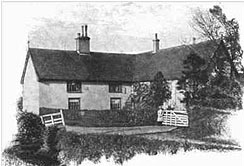 It was the home of Symond Fiske, Lord of the Manor. It is the oldest known home of a Fisk/e. The Fisk/e family no longer owns it, but it remains a working farm. The house appears today very much as it did in photographs taken in the late 1800's. The right to use the coat of arms was granted by the Herald's College in England to Professor Nicholas Fiske on November 9, 1633. Nicholas was a professor of "Physic." The charter acknowledges the coat of arms was used by his ancestor, Lord Symond Ffyske of Laxfield. Symond Ffyske (Fiske) was a Lord of Stadhaugh Manor, which is located near Laxfield, (Suffolk Co.) England. 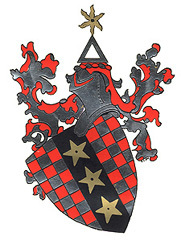 The coat of arms is described as chequy, argent and gules, upon a pale, sable, with three mullets pierced. These arms also bear a crest on the top of a triangle an estoile. If you are descendant of this line, the coat of arms makes an interesting conversation piece that pertains to your ancestor. The coat of arms featured on this page was manufactured for the Fisk/e Family Association, and it may not be reproduced. All rights are reserved. Are Fisk's and Fiske's All One Family? Did they originate from one core family? Probably not, but the surnames became intertwined with some families adding an "e" to the name Fisk and other dropping the "e" from the name. It is not uncommon to see both spellings within a single family genealogy. What Is The Oldest Known Portrait of a Fisk/e? 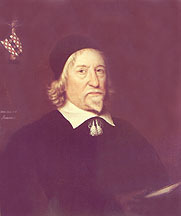 The oldest known portrait the Fisk/e Family Association is aware of is that of Nicholas Fiske, circa 1633, who was a professor of "Physic" in England. He registered the Fiske coat of arms with Herald's College in London. Nicholas Fiske had the coat of arms incorporated into the painting. The original painting hangs in the Ashmolean Museum in Oxford, England. The Fisk/e Family Association is seeking relatives of Billy Fiske who may have additional information about him. Please contact the editor, Irwin W. Fisk, P.O. Box 1336, Washougal, WA 98671, USA or call 360-825-3607. In the lower portion of St. Paul’s Cathedral in London lies the black marble sarcophagus of Admiral Lord Nelson, hero of Trafalgar. A few steps away, there is a plaque commemorating another hero who also died in battle. The plaque reads: PILOT OFFICER, WILLIAM MEADE LINDSLEY FISKE III, ROYAL AIR FORCE, An American Citizen Who Died That England Might Live. Billy Fiske had the distinction of the being the first American killed in WWII. He was born on June 4, 1911 in Chicago, IL. His family were investment bankers, so he was afforded the best in education, attending schools in the U.S., France, and eventually in England. In 1928, the 16 year-old Fiske led the U.S. Olympic Bobsled Team to victory at St. Moritz. In 1932, Governor Franklin D. Roosevelt watched as Billy Fiske carried the flag for the American team at the Winter Olympics in Lake Placid, NY. The American team again won the Gold medal. 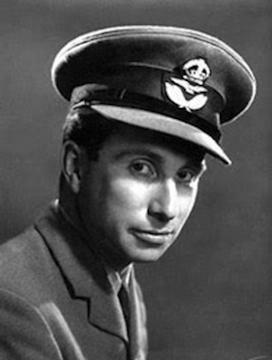 In 1939, England declared war on Germany, so Billy signed on as a pilot with the RAF. He soon distinguished himself as a fighter pilot with the 601 Squadron that was stationed at Tangmere. On August 16, German Stukas attacked the Tangmere Aerodrome. As the battle ended, Fiske’s plane caught fire as he was landing. Billy Fiske died four days later, and he was buried in Boxgrove Cemetery in Sussex, England. Where Can I Find a Lineage Chart of The Early Members of The Family? The early lineage of the Stadhaugh Fisk/e family is shown below. More of the Fisk/e lines can be found in various books written on the Fisk/e family. See our Sources page. 1.1.1.1.4.1.1.1.2.1.2.1 Lt. Nathan Fiske Lt. Problems or Questions About this Website?